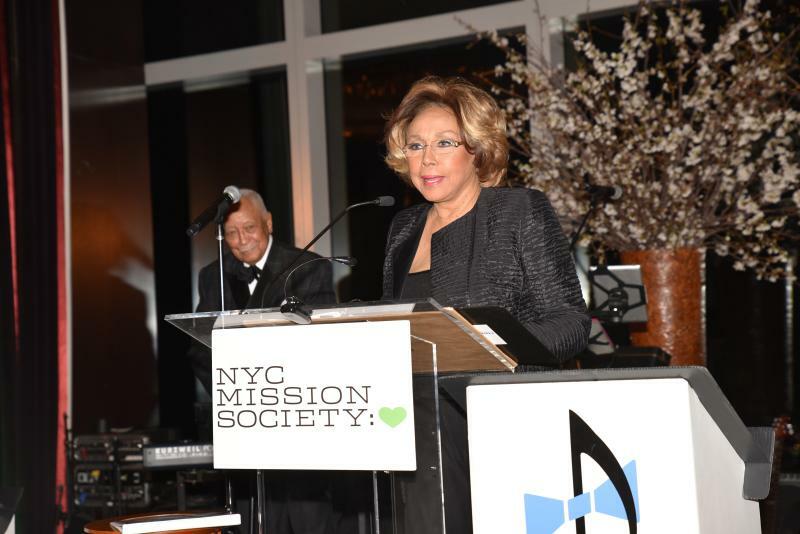 GOSH!ABOUT: NYC Mission Society Honours Legendary Diahann Carroll – GOSH!About: Fashion. Art. Music. Events. TV. Non Profits 'N' Lifestyle > Subscribe now! We are so excited to GOSH!ABOUT this year’s event with NYC Mission Society. On Wednesday, April 5, 2017, we had the pleasure of attending the New York City Mission Society’s annual Champions for Children Gala, raising a half million dollars to help youth and families in the city’s most underserved communities break the cycle of poverty and achieve success. Over 340 guests were in attendance. It was held at the Mandarin Oriental in Columbus Circle, in New York City, featuring a lovely dinner, music, and of course some dancing. WABC News Anchor Bill Ritter, a longtime supporter of the Mission Society, emceed the event. Performing was the legendary Kathy Sledge, of Sister Sledge; acclaimed singer Alex Donner and his Orchestra, and students enrolled in the Mission Society’s free after-school music education program, GRIOT. This year, the benefit honoured legendary singer and actress Diahann Carroll, as well as entrepreneur Don Peebles; plus recognition to lifetime members of the Mission Society’s Board of Directors. This event was co-chaired by Jean Shafiroff and Katrina Peebles. Among the notable guests at the event were the legendary Cicely Tyson, Gayle King, former New York City Mayor David Dinkins, Bronx Borough President Ruben Diaz, Jr., and designer B Michael. Legendary Diahann Carroll was presented with the Champions for Children Award. Born in Harlem, Ms. Carroll is an award-winning and trailblazing actress, successful entrepreneur, and devoted humanitarian. She has starred on stage, screen, and television. In addition to winning Tony and Golden Globe awards, Ms. Carroll has been nominated for Emmys, Grammys, and an Oscar over her long and prestigious career. She has devoted a considerable amount of time to support causes that are important to her. She served as an ambassador and national spokesperson for Lifetime Television’s breast cancer awareness campaign and has been recognised for raising awareness about HIV and AIDS. Mr R. Donahue (Don) Peebles is Founder, Chairman, and CEO of The Peebles Corporation was recognised as one of the most successful entrepreneurs in the country. He owns one of the country’s few national privately held real estate investment and development companies with a portfolio of projects in New York, Washington, D.C., Philadelphia, Boston, and Miami Beach. Mr. Peebles also is a top-selling author of The Peebles Principles and The Peebles Path to Real Estate Wealth. He a regular guest on CNN, CNBC, and FOX, as well as a highly sought-after speaker. It was a tremendous evening of having the pleasure to attend.